Born 30th October 1952, Arlen Roth grew up in New York's Bronx district. The son of famed New Yorker magazine cartoonist Al Ross, Roth took an early interest in the blues guitar stylings of BB King, Buddy Guy and Otis Rush. Attending the High School of Music and Art as an art and photography student, Roth was soon gigging locally. In 1971 he moved to Woodstock and started playing with John Sebastian and Paul Butterfield. 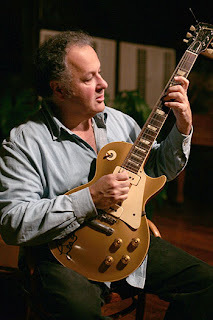 It was Butterfield who immediately noticed a stark similarity in Roth's playing style with that of Mike Bloomfield, his former guitar-playing partner in the Paul Butterfield Blues Band. In the mid-70's Roth was active in the New York session scene and toured with Art Garfunkel and Phoebe Snow. Roth made enough of an impression on Garfunkel to be invited to join the Simon & Garfunkel reunion tour in 1983. Perhaps one of Arlen's more unusual gigs was as guitar coach for actor Ralph Macchio for the 1985 film Crossroads, where he helped Macchio to convincingly mime his guitar parts for the movie. But Roth's greatest claim to fame has got to be his groundbreaking Hot Licks series of instructional tapes. What started out originally as a series of Roth's own lessons on cassette tape in 1981, the Hot Licks catalog soon grew to include players the caliber of Albert Collins, Steve Morse, Tal Farlow and John Entwistle. Check out the tres cool National 'map-shaped' guitar Arlen is holding in this early Hot Licks ad from 1981! Soon Hot Licks was producing lessons on videotape, allowing mere guitar mortals a peek at the genius and dexterity of players like Joe Pass, Eric Johnson and Vinnie Moore. Hot Licks single-handedly spawned the instructional video industry that fluorishes to this day. Check Out More Hot Licks DVDs Here!